Most people have received messages which at some point or other state "I would like to deposit 20,000,000.00 dollars in your account....". This is a common email fraud attempt which has been named the "Nigerian Prince" scam since the earliest versions of it were sent by a supposedly such member of royalty. You could read more about it in wikipedia, and a google search will show hundreds of related hits. The messages, although very different, have a similar pattern. In this bio-recipe we will try to construct the phylogenetic tree of these messages and hence reconstruct how likely it is that people have copied and modified the original message(s) and created new versions. If the authors had copied from a single source and then modified the messages to their own taste, this procedure would recreate the tree quite well. However, it is possible that messages have been merged or copied from several sources, obscuring the process. The latter would be equivalent to lateral transfer of genetic information. It is also possible that similar messages have been reinvented from scratch. In any case, the whole procedure is an interesting example that may serve as a pattern for dealing with text, for constructing phylogenetic trees from diverse sources, separating the members in clusters and on some special forms of alignment. The resulting tree is also interesting in itself. Applications outside molecular biology are also possible, e.g. the construction of a phylogenetic tree of some piece of software that underwent development at different places/times, would follow exactly the same steps. The raw email messages were collected for some time and kept in a standard plain text format. You can download the file from biorecipes.com, read it and do all the processing in Darwin. To store and process the messages we will define a class called Message . If it receives a single argument, it assumes that it is a raw message and proceeds to parse it. It is always convenient to write a method that will print the instances of the class, and finally we run CompleteClass which will generate some standard methods automatically. The following function converts a general text into a form suitable for comparison and alignment. The messages are written in an alphabet of 26 characters where upper and lower case letters as well as numbers and special symbols are used. The mapping of lowercase characters to uppercase characters, or the grouping of several symbols in the same class (e.g. punctuation) can be done with a mapping function included in the Dayhoff matrices. A new method ConvertMessage does this conversion, character by character. We search each character of the message in a string which contains all letters and digits (case-independent search). This is a simple and efficient way to find out if our character is a letter or a digit. The boolean variable spacing is used to keep only one spacing character per group. We will keep the first one, the rest will be just ignored. Finally, the result is accumulated in r , which may be shorter than the original string. One final exception is that in no case underscore characters are allowed in sequence alignment. The reason for this is that underscores indicate gaps, so if they would be allowed as sequence characters it would not be possible to determine where deletions happen. We transform all underscores to dashes. The function ShortId is an auxiliary function to select the first part of the sending email address. This is typically the User-ID, and it is intended as a quick identification of the email message. It searches for an "@" or a blank as a separator and return whatever comes after the "From" until the separator. Now we are ready to process all the messages in the string "all". Each message starts with a new line with the word "From" followed by a space, which is the standard email convention. We place all the messages in a list. For curiosity and checking, we can print one message. Pairs of messages which are identical serve no purpose whatsoever. They will be part of the same subtree, they contribute no useful information about mutations (there are none) but cost a lot of additional computation. Hence it is desirable to eliminate the exact repetitions. The following loop compares every pair of messages and, if they are identical, removes the second one from the list. Since the list may shorten during the process, the loops are controlled by a while condition. As expected, the exact duplicates come from (nearly) the same sender and at about the same time. This is expected from spam. Running the all-against-all of 348 messages requires too much time for a normal interactive session (60378 long alignments). We will set a flag, named PartialRun , under which we can run just a few entries to show the process while the complete results are read from a file. Conversely, if PartialRun is not set, the complete computation will be run, and the files of results will be stored. The Dayhoff matrices used for protein alignments are completely useless in this case. The symbols do not correspond to amino acids, and their mutation probabilities will certainly differ. This is a situation that may be encountered quite often in biology too when we are faced with sequences which are not average proteins. So the following analysis is also very relevant for biology - it is the standard procedure to derive Dayhoff matrices from new data. (1) (first time only) Select an initial Dayhoff matrix which is sufficiently diagonally dominant. That is, identical matches will be positive and mismatches will be negative. We start with a matrix at PAM 30 which has all mutations equally likely. We will call this matrix DM1. (2) Align all the sequences against each other with this similarity matrix. (4) From each of the selected alignments, count the matches and mismatches per symbol pair. Mismatches are counted 1/2 for each pair, as we do not know which one mutated into which. (6) Repeat from step 2 with these new matrices until convergence. Convergence is normally very fast, and in this example we will run a single iteration. For the initial matrix, it is easier to use the darwin function CreateDayMatrices which requires a matrix of counts for each pair of symbols. We will produce a synthetic counts matrix with all 1's except for the diagonal (10's). The set of all messages, assuming that they are all related, will form a phylogenetic tree. This tree is at this point unknown (and is what we want to construct). An excellent way to inspect all the pairs of leaves of the tree is by doing a circular tour of the tree in any of its planar representations. In the tour, we consider each pair of leaves and use the information of the path that connects both leaves. Each of the tree branches is considered exactly twice. This is very important; we do not want to over-represent information. Notice that in an all-against-all comparison, one would use some of the edges much more often than others. If shorter edges mean higher similarity, a planar tour has a minimum total sum of edges and a maximum total similarity. A circular tour with maximal similarity can be found by solving the Traveling Salesman Problem (TSP). The function ComputeTSP minimizes a tour, so we will complement the similarities such that by finding a minimum of the complements, we find the desired maximum. For convenience, we complement against the maximum so that all distances end up positive. For programming convenience we have added the first sequence of the tour to the end. We are now ready to follow the tour and, for each alignment, count all the matches in a Count matrix. For the partial runs, we usually have too few sequences, which means that some counts are left empty. When there are empty counts, it becomes impossible to compute the scoring matrix. To prevent empty counts for the partial run, we start with a 1 on each count and a 10 on each diagonal. If we were running a partial run, we would now read the full results from a pre-prepared file. We would also reset the number of messages and recompute the Dayhoff matrices. If this was a complete run, then we would create the file of results for future partial runs. For now, you can download the file 'AllAll.drw' here (AllAll.drw.gz). Place it in your working directory and load it with the ReadProgram method. The next lines of code are merely for reference; once you load the downloaded file, you don't need to run these lines anymore. It is interesting to see some alignments at different PAM distances. To make this easier, we write a function which selects the pair of messages which are at a distance as close as possible to a given one and then prints their alignment. This will allow us to test the limit of quality of the alignments. . . . . (5 output lines skipped) . . . .
...|. .|..|.....|..||||||||.||...|..|...|...||||..|..|.|. | .|...|| |........|. We can see that the boundary is fuzzy, but at 50 there are very large portions of text which have been duplicated whereas at 70, the relation is dubious. Consequently, we will choose 50 as the limiting distance for a trustworthy relation. It is interesting to notice that in Biology, we are used to consider and study homologies at much larger distances, up to 250 in a reliable way. Clearly the techniques that have been developed are much more sensitive than the human eye. . . . . (29 output lines skipped) . . . .
... which shows some of the structure, but still virtually impossible to find the details. These clusters are composed of truly related messages. We write a function to compute a tree for a given cluster. This function receives a set of Entry numbers (a cluster) and uses the AllAll matrix to select the desired alignments; no further computation of alignments is needed. The rest is identical to the previous tree construction. We now test the function over three largest clusters. To do this, we first sort the clusters by reverse size (so the three largest are the first three) and display the two largest. The clusters show a pattern which is typical of sequences which are mutated again and again and we have all the intermediate steps of their evolution (which is not the case in biology). 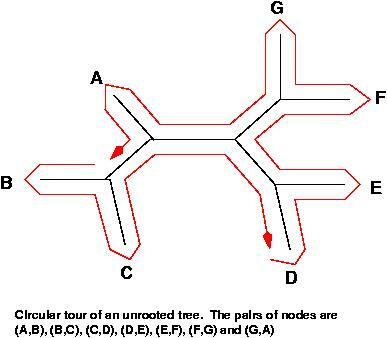 This is indicated by nodes which have branches so short that they lie against the main branch. As we collect more information, it is likely that we will connect some of the disjoint clusters. The source data for this bio-recipe (as an electronic mailbox standard format) can be found here.